Introducing my new range of hand knitted 100% italian cotton face cloths. These are soft and very funky. Something a bit different to use and decorate your bathroom. The can be used for babies to adults. They make great gifts for anyone..
Approx size - 18cm wide by 20 cm length. Combined freight $4.00 in Courier post bag. (2/3 items in large $6.50) Sent by Courier Post couriers. 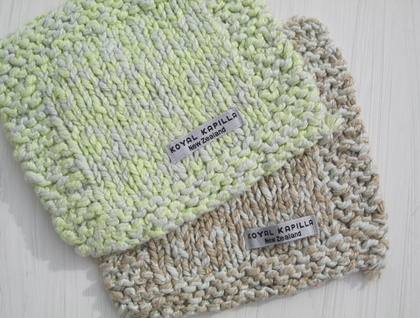 Koyal Kapilla New Zealand is designed & knitted inhouse in Auckland Studio. Yarns used are sourced from local suppliers as well as from Europe.